It is thus not surprising that someone came up with the question: Is social media ruining our minds? Obviously, the answer (or answers) to this question cannot be a simple one. Assisted Living Today ((Assisted Living Today)) has created an infographic summing up how social media may be messing with the human mind. To that, I say, thanks Captain Obvious. There are some pretty interesting numbers presented in the infographic about the effect of social media on our minds, though. The average attention span is 5 seconds. I guess I’ve lost you by now! Oh, and in case you think that age is to blame, studies have shown that younger people have shorter attention spans than the elderly. Go figure! 25% of people forget details – and even names – of close friends and relatives. This brings to mind how I used to memorize my friends’ phone numbers and birthdays. When I started using a mobile phone heavily many, many years ago, that all went out the window. 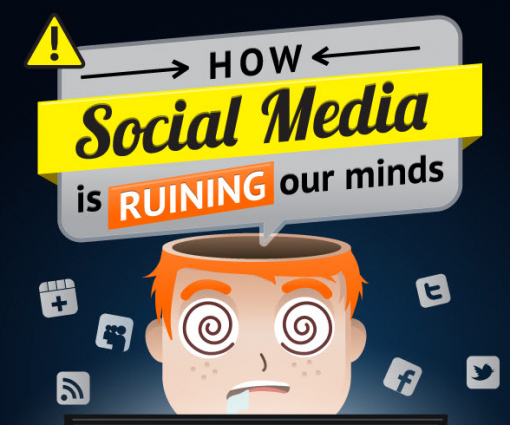 In any case, the point of the infographic is that social media affects how our brains evolve. Reading snippets and devouring content via video – negative results as compared to reading the long form. Studies also show that those who do not spend too much time online use their decision-making and problem-solving areas of the brain more.